This species is accepted, and its native range is South Sudan to N. Mozambique. Annual. Culms decumbent, or rambling; 30-100 cm long; rooting from lower nodes. Ligule a ciliate membrane. Leaf-blade base simple, or cordate. Leaf-blades lanceolate; 6-16 cm long; 8-18 mm wide; herbaceous, or membranous. Leaf-blade surface glabrous, or pilose. Leaf-blade margins scabrous. Leaf-blade apex acuminate. Inflorescence a panicle. Panicle open; ovate; 7-15 cm long. Primary panicle branches moderately divided, or profusely divided. Spikelets solitary. Fertile spikelets pedicelled. Glumes dissimilar; reaching apex of florets; thinner than fertile lemma. Lower glume ovate; 0.25-0.33 length of spikelet; membranous; without keels; 0-1 -veined. Lower glume lateral veins absent. Lower glume apex obtuse, or acute. Upper glume ovate; 1 length of spikelet; membranous; without keels; 5 -veined. Upper glume surface asperulous. Upper glume apex acute. Basal sterile florets male; with palea. Lemma of lower sterile floret similar to upper glume; ovate; 1 length of spikelet; membranous; 5 -veined; acute. Fertile lemma oblong; dorsally compressed; 1.5-2 mm long; indurate; pallid; without keel. Lemma margins involute. Lemma apex obtuse. Palea involute; indurate. Annual with scrambling culms 30–100 cm. long. Leaf laminae 6–16 cm. long and 8–18 mm. wide, lanceolate, acuminate. Panicle 7–15 cm. long, ovate, moderately to much branched. Spikelets 2–2.5 mm. long, ovate, glabrous or sparsely pubescent; inferior glume 1/4–1/3 the length of the spikelet, 0–1-nerved; superior glume 5-nerved; inferior lemma 5-nerved, male, its palea well developed; superior lemma and palea pallid, glossy. Annual; culms 30–100 cm. or more long, decumbent or scrambling, rooting at the lower nodes. Leaf-blades lanceolate to narrowly lanceolate, 6–16 cm. long, 8–18 mm. wide, cordate or straight at the base, herbaceous or membranous, flat, glabrous or pilose, scabrid on the margins, acuminate. 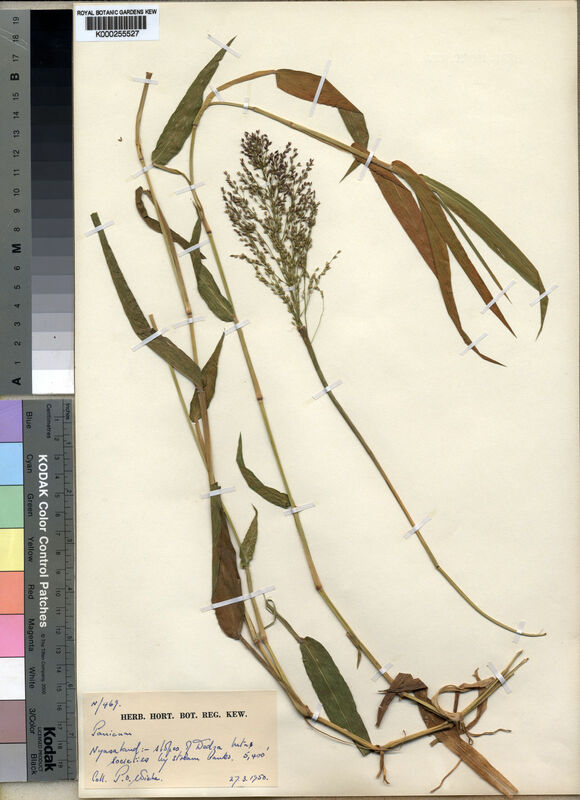 Panicle broadly ovate, 7–15 cm. long, moderately to much branched. Spikelets ovate, 2–2.5 mm. long, glabrous or sparsely pubescent; lower glume ovate, 1/4–1/3 the length of the spikelet, 0–1-nerved, obtuse or acute; upper glume ovate, antrorsely scaberulous on the back, 5-nerved; lower lemma similar, ♂, its palea well developed; upper lemma pale, shining. Forest margins and riverine woodland 1700–2200 m.